Is a decade-long bull run for gold coming to an end? Gold prices have suffered their sharpest fall in 30 years over the last couple of days, heightening fears among investors that the decade-long bull run for precious metals, especially gold, is about to end. The dramatic development started on 12th of April with 15thof April as the ugly black Monday for gold lovers. Gold has traded steadily between 1550 and 1615 during the first months of 2013, and then suddenly plunged USD 200. Shocked investors took a deep breath after losing confidence in the metal for which many thought that the sky was the limit. The volatility of market sentiments was demonstrated early Monday morning as investors debarred gold from its safe haven status in just a few short hours. As a result of the lost confidence in gold, the Japanese Yen (JPY), which had been suffering for the last few months due to aggressive Japanese economic stimulus and monetary easing, briefly regained its position as a safe haven candidate. The safe haven rally was short lived; USD/JPY jumped from a low 96 to above 98 yen to a dollar in just a few hours. Following a technical upward correction after the steep fall, markets continued to be extremely nervous, showing some similarities with market behavior in 2008 prior to the financial crisis that autumn. After a short rebound the selling pressure on gold continues. Close market followers could have noticed signals that investors were becoming increasingly skeptical about gold. For many years, it has been taken more or less for granted that gold is going to continue to rise and shine. However, if we look back at the gold graph of the last couple of years, we can see that there have been some worrying signals. Gold prices peaked and reached USD 1406 in early January 2011. There was a technical correction down, but between February and September gold prices rose steadily to USD 1920. A breakthrough of the magic psychological 2000 level seemed to be within reach and many investors betted on that opportunity. Instead, gold started to correct down steadily and moved sidelong before reaching an autumn peak at 1787 on October 1, 2012. It has been falling down since October with minor upwards technical corrections until it reached 1321 and rebounded to 1382. With the existing strong selling pressure and weak market sentiments there is no reason to believe that USD 1350 represents a bottom. In addition to the charts, which show a steadily falling curve since September 2011, there have been other reasons for concern. Major international banks have recommended selling gold. There might be numerous reasons why Goldman Sachs, Credit Suisse and Societe General are all in favor of liquidating gold reserves. The erratic and speculative way international banks have operated over the last few years, from manipulation with labor to excessive greed, demonstrated in both trading and investments, makes one ask, whether their recommendations are a new expression of speculative behavior to their own best benefit? Are gold sales boosted up, so certain market players can buy the precious metal back at strongly reduced prices? When George Soros recommends selling as he did a few weeks ago, when gold prices were USD 1615, there is a stronger reason for an alert.In spite of the fact that Soros operates on behalf of his own institutions, he was first and foremost considered to be an individual investor. Since the 1960’s it is a good idea for the markets to listen to his predictions and advices. Two years ago, Soros recommended to sell silver for USD 45, after its steady climb from USD 17 a troy oz. Silver peaked at 49,67 and has been continuously falling since, reaching a low of 22,65 on Monday, April 15th, 2013. In a short-term perspective, the technical upside correction already seems to have subsided. Gold simply seems to have no steam to lift the precious metal beyond the USD 1400 limit. There is no inflationary pressure to strengthen gold. Ever record-high US stocks have seen gold selling in favor of investments in stock markets, which as long as the monetary easing continues will be a far more interesting investment than placing money in the risky precious metal with market sentiments against it. The opportunity for central banks selling their gold reserves to finance own assets requests from international lenders as the European Central Bank (ECB) and the International Monetary Fund (IMF) added to the selling pressure on gold. This development was spurred by tiny Cyprus, but the idea was picked up by central banks in countries like Italy and Spain that are also under big pressure. There are, however, more optimistic outlooks pointing to a strong gold recovery at the end of 2013, even if most analysts seem to agree that it may take time before investors‘ confidence returns to the precious metals market. Gold is on the verge of being oversold. An oversold market shall create a tighter supply/demand fundamentals relation. Even if stock markets continue to raise, these rallies are artificial and are more based on monetary easing than on economic fundamentals. What is going to happen when the bubble bursts? Could gold then be back shining, considering that some central banks in emerging countries are buying gold to strengthen their reserves? There might be light in the tunnel for gold prices in the medium and long-term perspective. Having different opinion on future prices for Gold? At MAYZUS you can test your judgments, read more here. Mr. Treholt began his career as a journalist and foreign correspondent of the Oslo-based daily newspaper Arbeiderbladet in Norway. He then joined the Norwegian Royal Ministry of Foreign Affairs, where he was promoted to the position of Political Secretary to the Minister of Shipping and Foreign Trade, followed by his position as Deputy Minister of Law of the Sea. He held the position of Counselor for Economic Development and Social Affairs at the Ministry of Foreign Affairs, and was member of the Norwegian Mission to the United Nations, New York. Mr. Treholt retired from his diplomatic career and moved to Moscow, where he became CEO of ISMOS Trading, followed by his position of CEO of Rim Investment Management and FMC Securities in Cyprus. 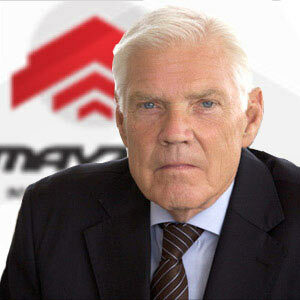 Mr. Treholt joined Mayzus Investment Company in June 2009 as Vice President, and he is also in charge of the business development and portfolio asset management of the company. He is the author of five books and numerous articles on economics and politics.